New Jersey Gov. Chris Christie has been releasing his tax forms annually since 2009. Ted Cruz is worth $3.2 million and Rand Paul is worth $1.3 million. Businesswoman Carly Fiorina, one of the wealthiest potential White House candidates, is worth an estimated $71 million. Welcome to the campaign for the hearts and minds of the middle class. In an election season expected to be dominated by appeals to blue-collar Americans, the ability of candidates to credibly connect with average voters will be a major challenge. Wealth defines the lives and backgrounds of most of the presidential hopefuls, potentially clouding their ability to project empathy for the plights of those struggling with rent payments, college loans, or child care. 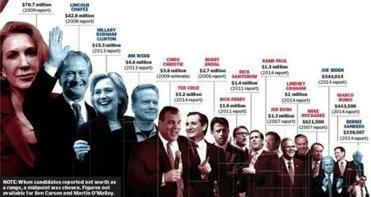 The Globe tracked down estimates for the net worth of candidates who have announced a presidential run, or are considering running. Recent surveys show that Americans feel left behind by the economic recovery. Growing majorities of voters — in both parties — say the gap between rich and poor has exploded. Pocketbook anxiety is rampant. About 55 percent of Americans said they are falling behind economically, according to a Pew Research survey released in January. Only 6 percent said their income is rising faster than their cost of living. The median household net worth in the United States is $81,200, according to a report released last year by the Federal Reserve. The median net worth of the burgeoning field of potential presidential candidates is about $1.5 million, according to a Globe review of previously filed federal and state financial disclosure statements of 18 hopefuls who have declared or are eyeing the race. Candidates who formally enter the primaries will have to fill out updated forms starting next month. The Globe has also requested the candidates provide income tax returns for the past five years, which would provide a more precise overview of how candidates manage their money. 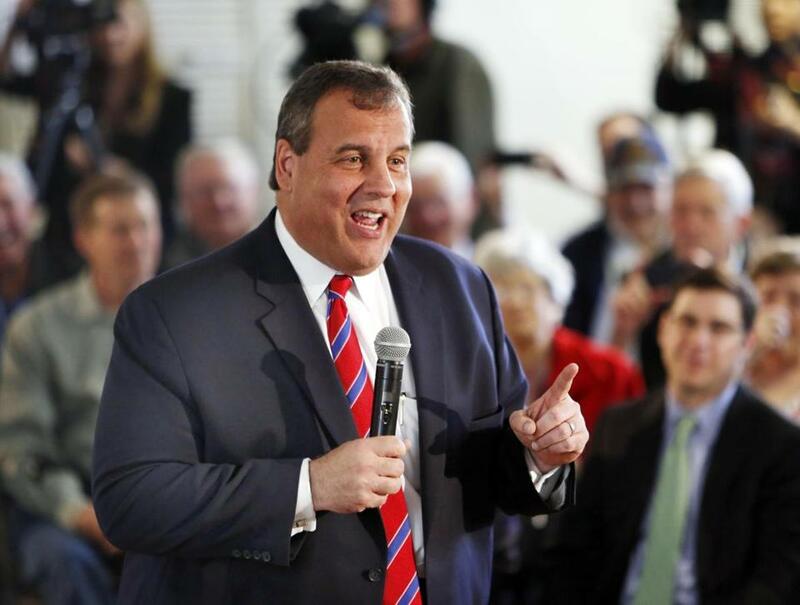 Hillary Clinton, former Maryland governor Martin O’Malley, Senator Bernie Sanders of Vermont, and Louisiana Governor Bobby Jindal all pledged to release some of their tax forms, and New Jersey Governor Chris Christie has been releasing his annually since 2009. American history is peppered with presidents who came from extraordinary wealth (such as the Roosevelts and John F. Kennedy) and extremely humble origins. Many of the founding fathers were wealthy, owning land, slaves, and estates. But Abraham Lincoln was born in a log cabin. Harry S. Truman nearly went bankrupt. Jimmy Carter was a peanut farmer who left office in debt and only became wealthy after writing more than a dozen books. How rich candidates wear their wealth often leaves a deeper impression on the minds of voters than their policy proposals. In the early phase of the 2016 presidential campaign, candidates from both parties have been anchoring their stump speeches with promises to address the growing wage disparity between rich and poor. Their messages emphasize upward mobility, offering competing promises to help Americans move up the economic ladder. Voters from the respective parties disagree on what should be done about financial inequality. Seventy percent of Democrats said the government needed to do more to shrink the gap between rich and poor, according to a Bloomberg News poll last week, while 75 percent of Republicans said the government should step aside and let the free market operate freely — even if it means a bigger gap. 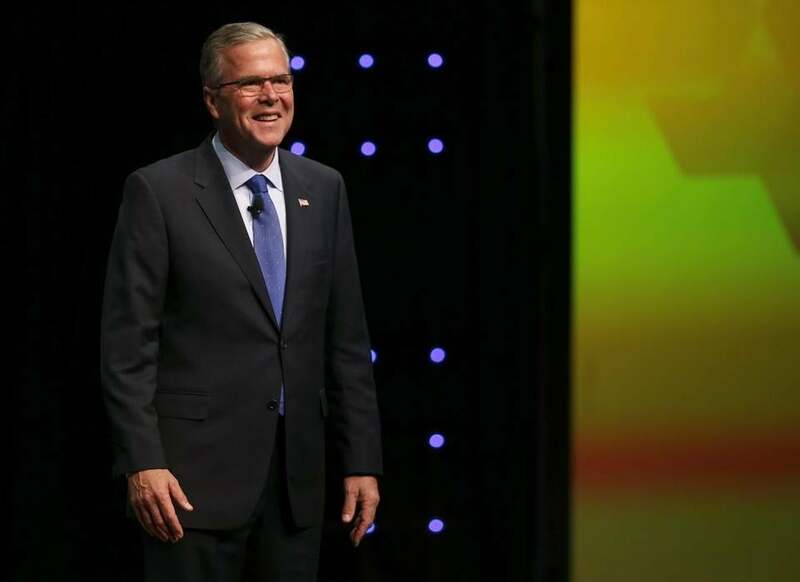 Jeb Bush, whose slogan has been to offer voters a “right to rise,” often talks about the poor on the campaign trail. He launched a political fund-raising committee by highlighting the pitch. Bush has come from privilege, growing up as the son of a congressman and attending the prestigious boarding school Phillips Academy, before he headed for the University of Texas Austin. When he became Florida governor in 1999, he had a net worth of about $2 million. By the time he left eight years later, that had dropped to $1.3 million. But since then, Bush has accumulated millions through advising corporations, taking speaking fees, and joining corporate boards. He has not filed a financial disclosure required of a public official since 2007. Former Florida Governor Jeb Bush in Columbus, Ohio. “He doesn’t have a governor’s mansion with a chef in it. He doesn’t travel by private plane or have a security detail. He hasn’t had a political staff,” said Ana Navarro, a Florida-based Republican who says some donors have complained to her that Bush’s suits look cheap and not presidential. Hillary Clinton came from a middle-class suburban Chicago family, enrolling in public schools and occasionally helping her father run his small drapery business. But it has been decades since she lived a middle-class life. Her efforts to connect have been clear. Last week, she stopped by a Chipotle in Maumee, Ohio, ordering a fruit juice and a chicken bowl with guacamole. She dropped into coffee shops in rural Iowa. And she was driven around in a van upon which she bestowed the distinctly lowbrow nickname “Scooby,” after a television cartoon dog. 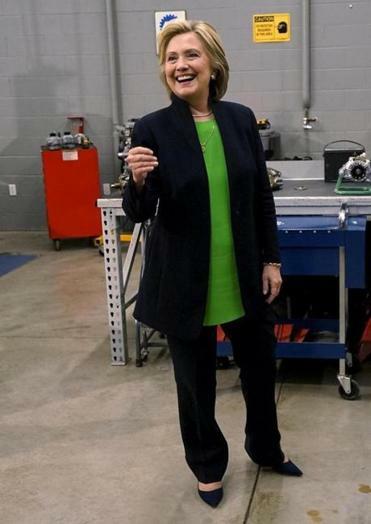 But Clinton also acknowledged last year that she hadn’t driven a car since 1996. She mulled whether to run for president while vacationing at the oceanfront home of Oscar de la Renta in the Dominican Republic. She was reported to have received a $14 million advance for the book she released last year. Over the past year, she continued speaking before groups large and small for a fee of at least $200,000 a speech — earning more in about an hour than an average American makes in about four years. “She has not driven a car in this century,” Madden said. “How do you relate to people if you haven’t driven a car? That’s an everyday American experience. Driving to work, sitting in traffic, picking up the kids. Getting your license renewed, paying taxes is an everyday American concern. Clinton has been obliquely referencing her wealth, telling voters in Iowa that everyone should be afforded the same opportunities as her 7-month-old granddaughter. 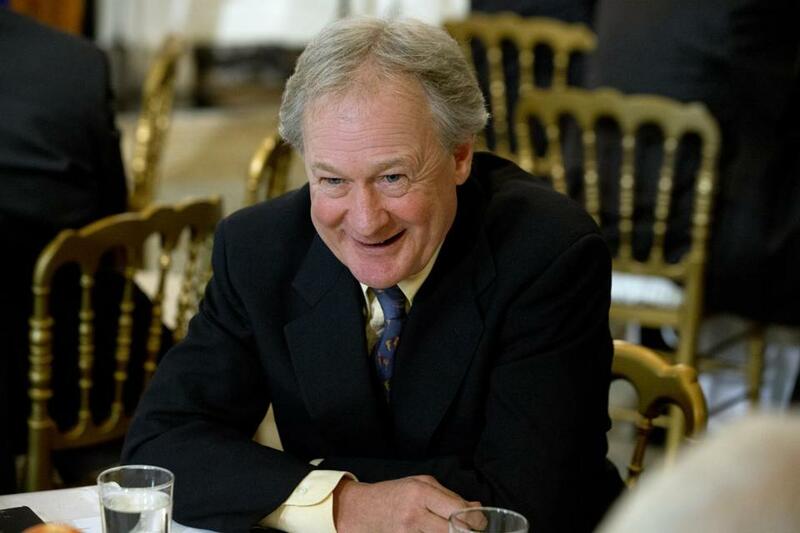 Former Rhode Island Governor Lincoln Chafee. Aside from former Rhode Island governor Lincoln Chafee — whose wife comes from a wealthy family — the rest of the potential Democratic field have net worths more line with average Americans. There is also broad economic diversity in the GOP field. Governor Scott Walker of Wisconsin has at least two credit cards — one of which is a Sears MasterCard — and he reported owing at least $10,000, and as much as $100,000, on them, according to state financial disclosure documents filed in January. A spokeswoman declined to say why his bills were so high and whether he was carrying credit card debt. He also has a car loan of $5,000 to $50,000. Walker has talked about how his mother grew up on a farm and didn’t have indoor plumbing when she was in high school. Part of his stump speech is about shopping at Kohl’s, and during remarks in New Hampshire last month he noted how on the previous day he had bought a $1 sweater from the store (he didn’t note that a few hours later he got on a chartered plane, donned a tuxedo, and attended the exclusive Gridiron Club dinner in Washington). “More than anything, my family ingrained in me the idea that anyone who worked hard could go as far as their dreams would take them,” he said in a budget address this year. Senator Marco Rubio of Florida describes how his father, a bartender, and his mother, a maid, achieved the American dream. “But now, too many Americans are starting to doubt whether achieving that dream is still possible,” he said last week in announcing his campaign. Donald Trump, who has formed a presidential exploratory committee, has made ostentatious displays of wealth a calling card. Forbes pegs his net worth at $4.1 billion, but his aides argue that it should actually be listed at more than $10 billion. Yet the man whose private jet has 24-carat gold seat belts says he, too, is trying to figure out how to connect to the middle class.